"Monsters? Oh, child, if only thou hadst seen what I hadst seen." Living a dual life is nothing new in comics, considering most characters are regular people by day and superheroes by night. THe dichotomy still makes for interesting stories though. 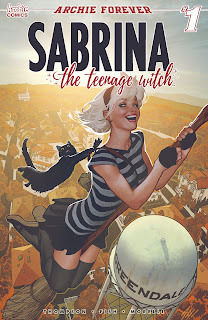 In Sabrina the Teenage Witch #1 from Archie Comics, Sabrina Spellman is looking to be both a mortal and a witch. The issue is written by Kelly Thompson, illustrated by Veronica (and Andy) Fish and lettered by Jack Morelli. As a character, Sabrina has always exuded a certain confidence and charm which are two traits that Thompson ensures the reader sees in her in the first issue. Thompson has such a firm grasp on the character that Sabrina essentially demands the reader's attention throughout the issue which is a strong introduction to Sabrina. Following Sabrina through a standard weekday, Thompson shows the reader the best friend, the rival, the crush and the attention-seeker--all of whom look to interact with Sabrina for various reasons. The pacing of the issue is very methodical as Thompson follows Sabrina through all these new meetings at school. The witty and rapid-fire dialogue by Thompson is very strong, but some of it does feel a little disingenuous for high school students (although it certainly doesn't detract from anything). Fish does a wonderful job with the linework, illustrating Sabrina and her aunts in a way that should be familiar to fans of the property. Sabrina's face, eyes and her expressions in particular are emphatically charismatic, underscoring her personality as a half-mortal, half-witch as one brimming with confidence. The pages are organized with an attention to relatively standard layouts as Fish keeps things neat and tidy from a paneling perspective (save for a few insets and overlays). And while the backgrounds aren't teeming with detail, Fish still manages to make them feel inhabited by the characters. The colors pop (although much of the issue feels green because of the high school backgrounds) and Sabrina's hair in particular allows her to stand out from everything that's happening. Sabrina the Teenage Witch #1 is a very well-written and entertaining first issue that truly captures the spirit of the main character. Sabrina has always maintained a steady undercurrent of awareness throughout the years and recently the character is benefiting from a resurgence in popularity. Thompson's script is whip-smart and amusing, establishing the setting and characters in a way that's befitting of Sabrina's lifestyle. The artwork by Fish is perfect tonally for the story and excels at conveying to the reader Sabrina's world. Sabrina the Teenage Witch #1 is a lot of fun and should definitely be checked out; even if you're not a fan of the character in general this issue is really good. 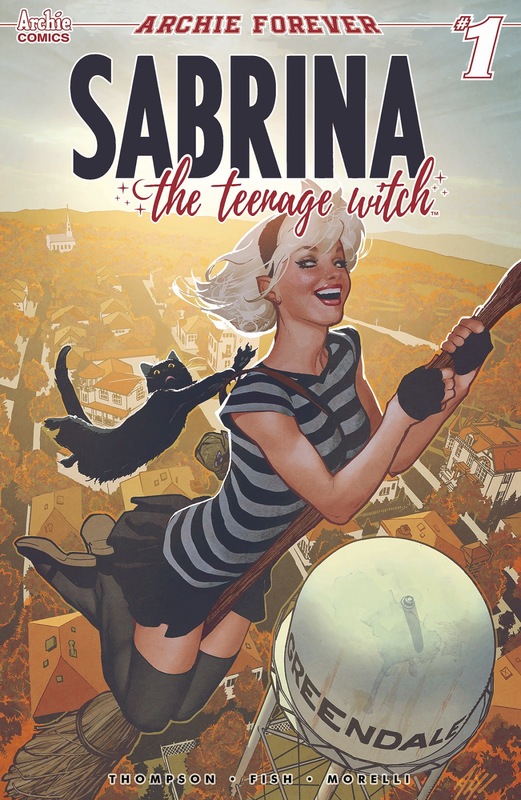 Sabrina the Teenage Witch #1 is available now.